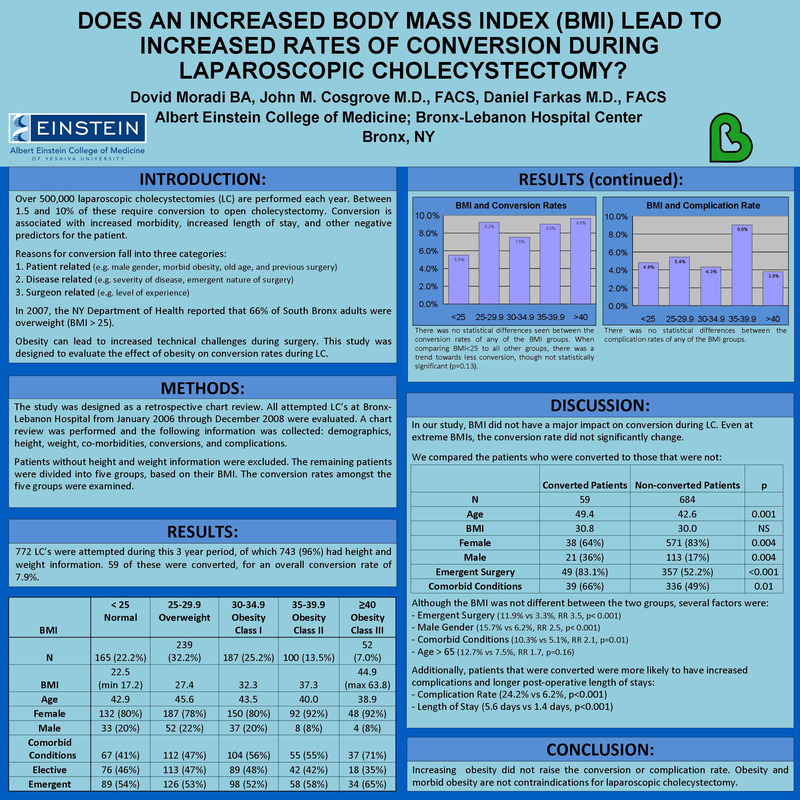 Does an Increased Body Mass Index (bmi) Lead to Increased Rates of Conversion During Laparoscopic Cholecystectomy? Introduction: Cholecystectomies are one of the most common procedures in general surgical practice. The laparoscopic approach has become the standard technique. However, a certain number of patients end up requiring conversion to the open technique, for a variety of reasons. Obesity can lead to increased technical challenges during surgery, which can make the laparoscopic technique difficult to accomplish. The purpose of this study was to evaluate whether increasing obesity led to increased rates of conversion during laparoscopic cholecystectomy. Methods: We performed a retrospective review of 801 consecutive patients who had undergone an attempted laparoscopic cholecystectomy between January 2006 and December 2008. Of these, height and weight information was available for 769 patients (96%). The Body Mass Index (BMI) was calculated for these patients, and the patients were categorized into five groups: Normal Weight (BMI<25), Overweight (BMI 25-29.9), Class I Obesity (BMI 30-34.9), Class II Obesity (BMI 35-39.9), Class III Obesity (BMI≥40). Conversion rates were examined in each group. Although there was a trend to less conversion in patients with a BMI < 25, this was not statistically significant (p=0.06). The remaining groups were very similar in their conversion rates. Conclusions: Although increasing obesity can make a laparoscopic cholecystectomy more difficult to perform, it did not lead to increased rates of conversion in our study. Other factors (e.g. severity of the disease) had more of an impact on the conversion rate than the patient’s BMI. Morbid obesity alone should not be a contraindication to the laparoscopic technique for a cholecystectomy.